Huge Savings Item! Free Shipping Included! 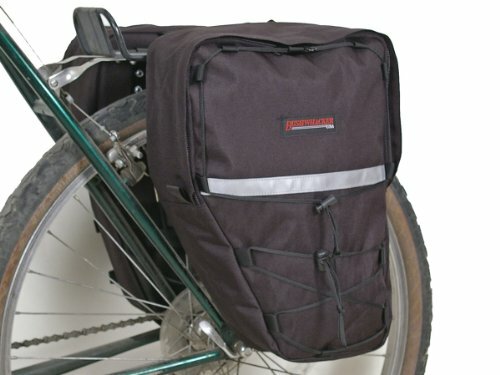 Save 19% on the Bushwhacker® Moab Black - Bicycle Rear / Front Pannier Cycling Rack Pack Bike Bag - w/ Reflective Trim - Sold as Pair by Bushwhacker at Joes V Cycle. MPN: 1. Hurry! Limited time offer. Offer valid only while supplies last. The large-capacity main compartment of the Moab features covered zippers and adjustable compression straps. Reflective trim increases visibility. The large-capacity main compartment of the Moab features covered zippers and adjustable compression straps. Reflective trim increases visibility. Sold as a pair. Dimensions: 10.5" Length x 4" Width x 14.5" Height. Color: Black. Designed for front or rear bicycle racks. Sold as pair. Each pannier quickly attaches to the top of the rack with two metal hooks and the bottom of the rack with an adjustable bungee and S hook. Constructed with durable 600 denier polyester. Reflective trim increases visibility. Compatible with Bushwhacker Mesa trunk bag. Dimensions: 10.5" Length x 4" Width x 14.5" Height. Color: Black. If you have any questions about this product by Bushwhacker, contact us by completing and submitting the form below. If you are looking for a specif part number, please include it with your message.